The exhibition offers a concise yet representative overview of the birth of the photomontage process as an art form as it simultaneously developed in different milieus, specifically Germany and the Soviet Union in the 1920s, with special focus on the interwar period, when the technique first emerged and was adopted as an artistic medium. The exhibition is drawn primarily from the Merrill C. Berman Collection in the United States, and features over a hundred works on diverse subjects by artists and graphic designers from ten different countries. Along with photo collages and maquettes, the show also includes posters, postcards, magazines, and books. In the hands of artists such as El Lissitzky (1890–1941), Aleksandr Rodchenko (1891–1956), and Gustavs Klucis (1895–1938), photomontage soon became a powerful political weapon in Soviet Russia, the immediacy of the photographic image used to its full potential in the creation of propaganda posters touting the Soviet regime, the country's economy, and the myths of Lenin and Stalin. Influenced by the creations of the filmmakers Sergei Eisenstein (1898–1948) and Dziga Vertov (1896–1954), the Stenberg brothers–Vladimir (1899–1982) and Georgii (1900–1933)—masterfully combined photomontage and cinema, which was, undoubtedly, the art form that best suited the assemblage of images in motion. 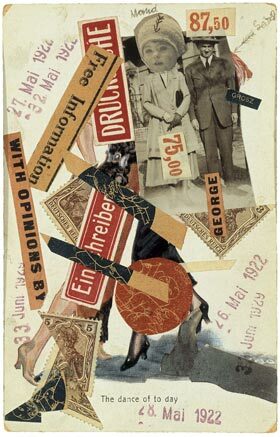 Almost simultaneously in Germany, photocollage and photomontage became fundamental to the work of Kurt Schwitters (1887–1948), while John Heartfield (1891–1968) and Max Burchartz (1887–1961) used the technique as a means of condemning the National Socialist regime as it rose to power in the 1930s. Dutch artists César Domela–Niewenhuis (1900–1992), Paul Schuitema (1897–1973), and Piet Zwart (1885–1977) availed themselves of the effectiveness of photomontage and applied it to their advertising, publication, and magazine designs. The exhibition is accompanied by an illustrated catalogue, in both Spanish and English editions, featuring an essay by Adrian Sudhalter, as well as a chronology of the era, and a selection of period texts —several published in translation for the first time— by some of the represented artists.